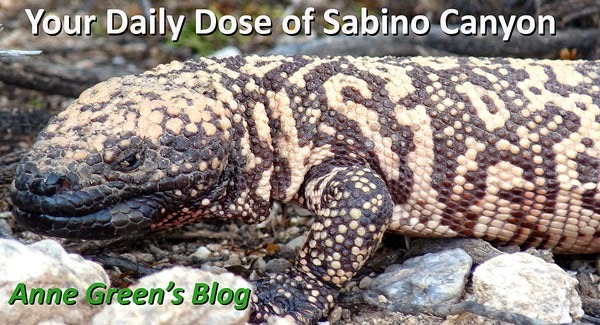 Your Daily Dose of Sabino Canyon: Know your canyon volunteers! Since the closure, I'm sure you've noticed more uniforms of various kinds and wondered who's who. Volunteers in Forest Service green are the Santa Catalina Volunteer Patrol. Normally, they patrol trails in the Santa Catalinas (mainly in Sabino and Ventana Canyons and trails on Mt. Lemmon), answer questions, help hikers, pick up trash, etc. During the closure, they aren't allowed on the trails, either. But you'll see them on the road and at trail heads in Sabino Canyon and at trail heads on Mt. Lemmon. There is generally a training class in February. Apply now to join! Volunteers wearing a shirt with a version of this logo are - you guessed it - the Sabino Canyon Volunteer Naturalists. They do three main programs: Kindergarten, Elementary, and Public Interpretation. The latter includes nature, plant, bird, and lizard walks, summer reading program for kids, Girl and Boy Scout hikes, exhibits and tables at the visitor center, etc. These volunteers take a 15-week training class that starts in early September. There's still time to apply. During the closure, they are walking the road in Sabino Canyon and are also 'stationed' at trail heads to answer questions about the closure and the canyon. 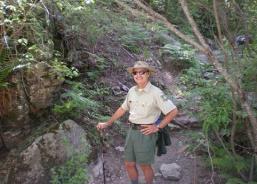 You'll only see them on duty in Sabino Canyon - and, like everyone else, they are not authorized to be on the trails. The only group authorized to patrol on the trails in the Coronado National Forest are the volunteers from Southern Arizona Search and Rescue. I won't reveal what they wear, because if you see one of these volunteers during the closure, well... you probably shouldn't!